The remote-controlled Emily robot can reach struggling swimmers far faster than a lifeguard. The European refugee crisis isn’t so much a crisis as it is a catastrophe. Fleeing violence in Africa and the Middle East, particularly Syria, more than a million migrants crossed by sea into Europe in 2015. Almost 4,000 of them lost their lives in the journey. The sea crossings can be especially dire, as leaky, unsafe boats capsize or break apart in rough water. In Greece the danger has proven massive, particularly off the island of Lesvos, which takes in an average of 2,000 refugees daily. Every day around Lesvos the Coast Guard must rescue boats that have capsized, run out of fuel, or simply broken down. Which is why the Coast Guard invited a team from Texas A&M University’s Center for Robot-Assisted Search and Rescue to launch a pilot project this week for a very special robot—Emily, the Emergency Integrated Lifesaving Lanyard. Think of Emily as a life preserver melded with a jet ski. It’s about four feet long and shaped like a pickle spear. An operator remotely controls the robot, tethered to a rope up to 2,000 feet long, to migrants struggling at sea. The victims take hold of the buoyant bot and a rescuer reels the line in. Quadcopter drones called Fotokites, themselves tethered on 30-foot ropes near the operators, pipe back an overhead view. In fact, NGOs on the island had already been thinking about using UAVs to aid rescue efforts, says Robin Murphy, the Texas A&M roboticist running the project. “In the meantime we were saying, ‘You’re talking about people drowning,'” Murphy says. UAVs turn out to run afoul of Greek aviation regulations anyway—and a tethered quadcopter isn’t considered a UAV. Combined with Emily, the drones make for a powerful (and legal) way to spot and save people in the water. 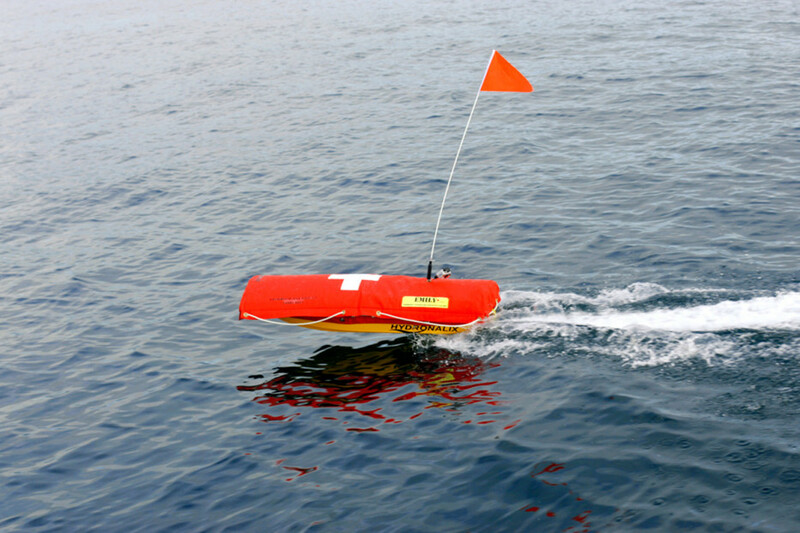 At a constant full speed of 20 mph, the robot has enough juice for 20 minutes at sea, plenty of time to make several trips to fetch victims—especially since it only needs to propel itself on the outbound leg. And it’s buoyant enough to hold five people at once. “We can run the boat out there and we can start plucking people that can actually hold on and get them out of the way,” says John Sims, a fire captain formerly of the US Coast Guard, who’s operating the robots for the deployment. That’s the plan, anyway. Emily has never faced a test like this. The robot has helped struggling swimmers here in there in America, but deploying it in Greece is a tremendous scale-up. “One has to be a little bit careful,” says M. Ani Hsieh, co-chair of the Safety, Security and Rescue Robotics committee at the IEEE Robotics and Automation Society. It may well be, for instance, that Emily is more useful for plucking a single swimmer out of the water instead of big groups. 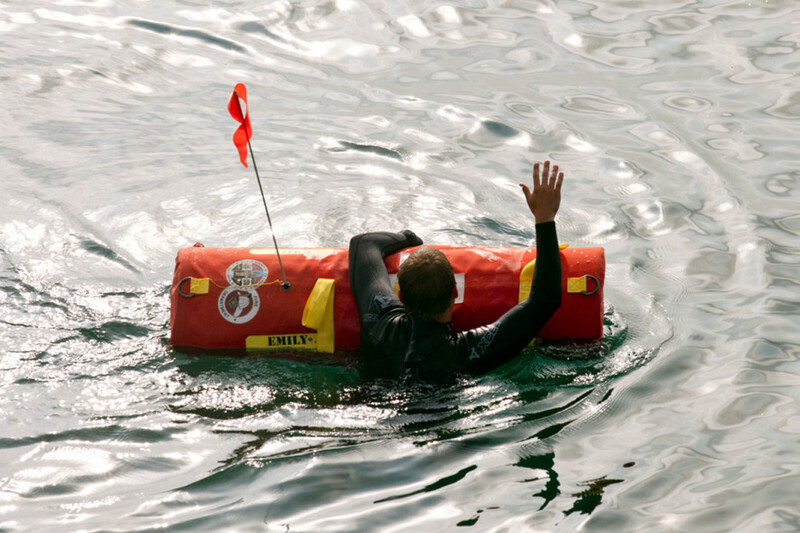 The buoyant bot can hold around 5 people. And as with any interaction between humans and increasingly sophisticated robots, the pilot project has risks. Its designers know, for example, that Emily’s long tether could get tangled in the propeller of a Coast Guard boat. But the important distinction here is the team has the Coast Guard’s blessing. Coordination among NGOs, independent volunteers, and the Greek government has been lousy on Lesvos, says Boris Cheshirkov, spokesman on Lesvos for the Office of the United Nations High Commissioner for Refugees. The Texas A&M roboticists hope to avoid those conflicts. The Emily team is confident enough in the robot’s abilities that it’s already raising funds to leave one of the robots behind in Greece. The machine can’t stop war or uncapsize boats, but but any tool that helps in the fight against catastrophe is a good one.